Existing weeds and their seed bank, what to do? Existing Weeds and their Seed Bank, where you want to replant native plants. Interstate 80, Solano County, near Jct. Milk Farm Road. Yellow starthistle. 1. 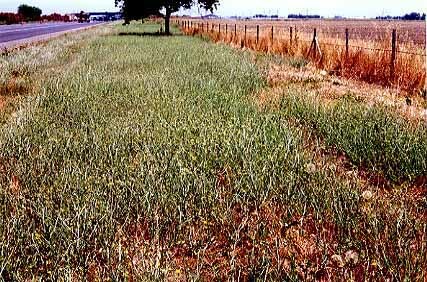 Why is the starthistle only along the road and not on the other side of the fence? 2. Will the existing weeds interfer with establishing natives in this area, and what do you have to do? 3. Will the existing seedbank of weed seeds in the soil interfer with the establishment of natives in this area, and what do you have to do? Photo and text copyright © 2000 by Craig Dremann, The Reveg Edge, Box 361, Redwood City, CA. 94064. - Updated April 30, 2016. Back to Craig Dremann's Contents page.